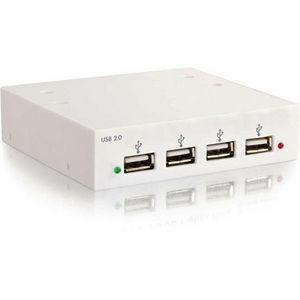 The Cables To Go USB 2.0 high speed Front-Bay Hub has 4 ports that will connect to either USB 2.0 high speed or USB 1.1 peripheral devices. The internal USB hub can be mounted into any 3.5 inch drive bay allowing for hassle free front-side connection of USB devices. With four downstream ports, it is designed to work with mice, keyboards, CD-R/RW's, hard drives, webcams, flash card readers and other USB enabled devices. The USB 2.0 high speed Front-Bay Hub can transfer data at 480 Megabits per second, making it 40 times faster than previous USB adapters and 20% faster than FireWire. The plug and play design makes for easy, trouble-free installation of your USB devices.